The Black Market Trust are an American pop/vocal jazz band whose current release II combines the sounds of the great American crooners and vocal groups with the romantic Eastern European gypsy fire of jazz guitarist Django Reinhardt. 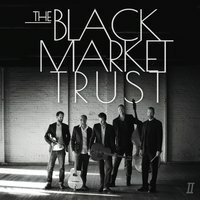 Consisting of five world class musicians who have traveled the globe recording and performing on the world’s biggest stages and with music’s most renowned artists, The Black Market Trust capitalize on their experience and pedigree to deliver a sophomore album that manages to bring a new and exciting sound to 12 tried and true classic songs. 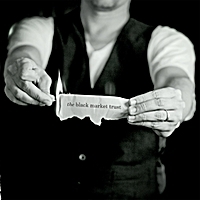 The band’s all-instrumental debut studio album, The Black Market Trust, released in 2012, is widely regarded as a milestone in the gypsy jazz world. The band’s lead guitarist, Jeffrey Scott Radaich, gained notoriety for his technical prowess and musicality. He has been touted as one of the most innovative and influential American acoustic gypsy jazz guitarists today. With their first release, the band established themselves as leaders and innovators by combining pop “Brill Building” sensibilities with the traditional sound of Django Reinhardt’s Hot Club of France Quintet. The animated video featuring their song Referential Integrity has garnered over one million YouTube views. Merging their love of everything from The Mills Brothers to The Beach Boys, Sinatra to Lennon/McCartney, the band began to arrange lead and 3 part vocal harmony lines to 12 of their favorite Great American Songbook standards. Using Radaich’s emotive, light baritone as the focus and surrounding it with Netzley’s pure tenor and Irwin’s rich bottom-end, the band began to melt two distinctly different vibes- one of a gypsy campfire, the other a slick metropolitan nightclub- into a cohesive, stylish sound. With II ,The Black Market Trust have organically created a new sound that is daring, fresh and exciting yet somehow still familiar and inviting. Combining old world romance with new world form, The Black Market Trust have crafted a simple, elegant and well-defined classic sound. All About Jazz musician pages are maintained by musicians, publicists and trusted members like you. Interested? Tell us why you would like to improve the The Black Market Trust musician page.